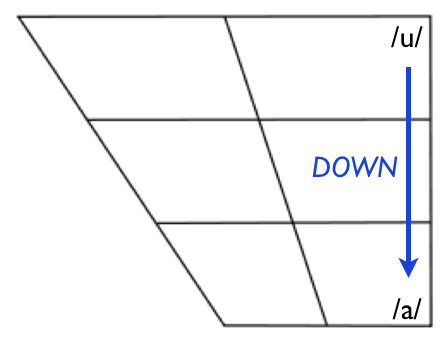 The most difficult sounds for English learners are the vowel sounds. Even though the English writing system only has five vowel letters - (a, i, u, e, o), there are actually 16 different vowel sounds that you will need to master to speak American English with a good accent! The first step is to learn how to tune your vowels. For this process, you will learn how to adjust your tongue to make the correct vowel sounds. Before you can "tune" your vowel sounds, you will need to understand what a vowel sound is. Air passes out of your mouth with your vocal cords vibrating. Nothing in your speech organ gets in the way of this voiced air. For now, we will only focus on the first and most important feature: Tongue Positions. The diagram on the right illustrates this. 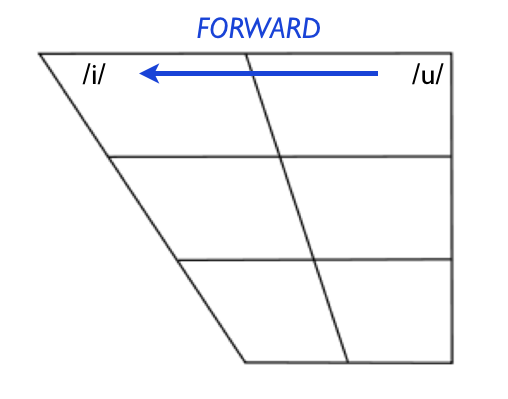 A vowel chart is a geometric representation of the mouth when viewed from the side. Every English vowel has it's own tongue position, so to mispronounce an English vowel means to place the tongue in the wrong position. When you create the wrong vowel in your recording, I will tell you move your tongue UP, DOWN, BACK or FORWARD to tune it to the correct vowel sound. To help you visualize, I will also link you to a page with a vowel chart that shows the difference between the correct vowel and the incorrect one. At first, you will not be aware of your tongue position in the mouth, or even what it feels like to move UP, DOWN, BACK, FORWARD. Tongue movement is something that we do naturally without seeing or thinking about it. But you can develop tongue awareness, and the more aware you are, the better you will be able to mimic native English. In the audio recording below, I alternate back and forth between the /a/ and /u/ vowels. When going from /u/ to /a/, my tongue moves DOWN. When going from /a/ to /u/, my tongue moves UP. Mimic what I am doing in the recording, then use the diagrams to try to develop an awareness of these UP & DOWN movements. 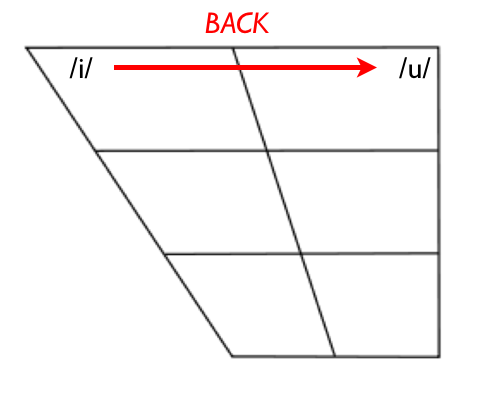 In the next audio recording, I alternate back and forth between the /u/ and /i/ vowels. When going from /u/ to /i/, my tongue moves FORWARD. When going from /i/ to /u/, my tongue moves BACK. Mimic what I am doing in the recording, then use the diagrams to try to develop an awareness of these BACK & FORWARD movements. The vowels /a/, /i/ and /u/ represent the extremes of your mouth, so it easier to feel the difference between them. But for smaller differences it will be much more difficult to tune. Nevertheless, having a direction to move in and a visualization of that direction helps a great deal. ﻿Because English spelling is inconsistent, you never never say for sure what the vowel sound of a word is by reading it. Every sound has ONLY ONE symbol. Every symbol has ONLY ONE sound. Below, I list each of the vowel sounds in North American English, along with an audio recording where I say each sound, along with an English word with that sound. Don't worry about learning them for now; you will get A LOT of review as you do the song training. For now, just review the sounds, and if you wish to learn more about a particular sound, click on it. Vowel sounds are created when voiced air passes through the mouth without any block. To change a vowel sound, you can move your tongue UP, DOWN, BACK or FORWARD. Click the "Continue" Button Below.